I share a tenuous link to Randy David. He went to the same university as my favorite teacher who was a visiting scholar in UP for two years. Manchester University has a tradition of progressive thinking, perhaps owing to its history as one of the first industrial cities in Britain. In his column today he makes two points I wholeheartedly agree with, one about the authenticity of our 'electoral' democracy and the other about the spectacle of our politics today. It is my belief that, as it stands today, institutional politics—especially its regular electoral expression—has become nothing more than a way of further assimilating our people into a diseased social system. It offers no paths to social transformation. It deadens all instincts for balanced growth. It offers entertainment and diversion, instead of debate and the contest of visions. It forecloses options, rather than open new spaces for invention. The British writer Simon Critchley thinks of politics as “the creation of such a space around a demand and then articulating it in relation to the state.” The demand, whatever it may be, acquires an unstoppable force to the extent that it can be woven into an ethical narrative. There has to be “a moment of sacralization in the constitution of any polity,” says Critchley. From the perspective of the political subject, I believe that. Using this simple concept of politics, let me point to remaining pockets where, I think, real politics may still be found in our society today. And what do you know? One such pocket of 'real' politics is still the politics of land. I await the day when elections cease being solely the province of 'who' (and the dynamics of the hows and whys among them) but also the province of debate over ideas, real problems and possible solutions. 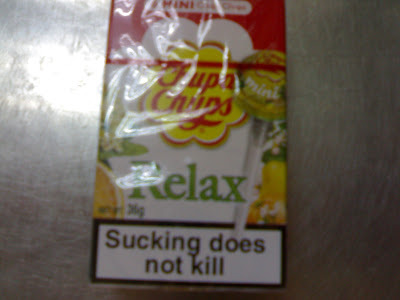 Relax, CBCP, sucking does not kill! "Good god woman, I know I'm a hunka burning love. Now leave me alone so I can get some sleep." 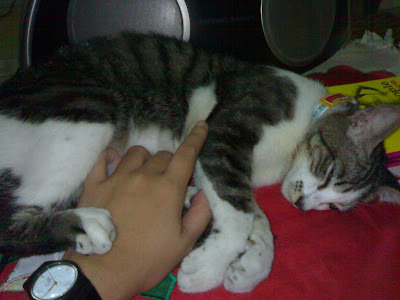 - Tinay, my (male) cat. Malate Church stood guard over the square, a mother coldly surveying her frolicking children. We were full from the surprisingly not inexpensive dinner at a dodgy-looking Chinese place nearby and N, playing balikbayan tourist to his patrie, decided to stop at the fountain to take in the scenery. I had not been in Manila at night for a while, and I was seeing everything with newish eyes. The music blaring from the speakers, the glowing toys displayed by ambulant vendors and finally the water spewing from the neon-lit fountain, all combined to make a heady mix of the surreal. There were adults and little children sleeping on cardboards on the sidewalk. They looked emaciated and greasy, but content to be in the embrace of merciful Mother Church and within begging distance of her more fortunate devotees. Earlier I had bought cherry-flavored candy from a youngish looking woman and her brood of five or six, there were so many. The kids, still hyped on childhood, reeked enthusiasm. The youngish woman’s eyes though looked beaten, glazed perhaps from hunger and humidity. I wondered how long it took to have the shine in her children’s eyes dull to such a state as hers. N and K sat on the lips of the fountain, their frames haloed in shimmering reds and oranges. I had my back turned when I heard the peals of laughter. A little boy was splayed on the ground, while three others squealed in delight at the misfortune of their fallen comrade. They couldn’t have been older than eight or ten. All clutched at roses. Roses for sale! Roses for sale! The little boy got up and the young ones playfully shoved and teased each other. Soon they were cajoling N to buy blooms for K.
How a little girl could have known to do such a thing and for the tallest to know that it was cause for derision, are things I will probably not see with my own eyes. Child prostitution, so cold a term, doesn’t quite translate the loss of innocence. For a moment I thanked my lucky stars I could afford to keep mine even as these little children could not keep theirs. I looked across the square at the sleeping hulk of Malate Church, her shadows sheltering the most unfortunate of her brood. What unspeakable horrors has she witnessed even as she stands there, mute? The sun was four inches above the waters of Manila Bay when we finally made our way to the little gathering of determined individuals who were protesting the Great Book Blockade. Because nothing really happens unless the media covers it, I was glad to see GMA7 sent a news crew to interview the organizers and document participants of the book swap. We arrived when there were only a few dozen books left for the picking. I suppose they went really fast. People were clicking away at the books and each other when I spotted my friend chatting up a man puffing away at a tobacco. An event like that could only attract nerds, and he was a good sort. After their exchange about tobaccos I quizzed him about why he was at the event. I must confess the government’s book taxing shenanigans never got a rise out of me. There is a point where one is inured to it all, and I always thought that compared to people being made to disappear or denying land justice to farmers, taxes on books merited less of my emotional engagement. As frenetic as EDSA on a Monday morning, the conversation went all sorts of places pretty quickly. I forget now the details of what we talked about, but I am left with impression of one person who, hopefully, mirrors the many more hiding in the woodworks, raring to fight back against the wrongdoing of those in power. His head was covered in anti-sun gear, a grayish fisherman’s hat and dark lenses on his glasses, every once in a while taking a drag at the prize between his index and middle fingers. From the Bataan Death March to the activism of his folks in the Martial Law era, he painted quick splashes on our historical canvass. “Did you see who carted away the books first?” I murmured a negative, having come a bit late. He motioned his head to the inhabitants of the Manila Bay area, skin darkened from sleeping underneath the naked sky. To be clear I said, “You mean the Great Unwashed carted most of the books away?” In a conspiratorial way only journalists would ever be able to manage, he murmured an affirmative. “You see, we the so-called enlightened ones like to assume the hoi polloi would never care for books. But right there, before my eyes, was proof that isn’t true.” Indeed. The printed word is a luxury for many. In our little enclaves we tend to forget the great privilege of being able to make sense of letters strung together. What jewels they must be for those whose precious monies must be spent on not starving. So much of who I am, what I believe and how I perceive the world and my place in it have come from all that I have ever read. Stripped of all that, what would I be? A tiny woman with yellowed teeth and bulging eyes sidled along me and two friends in conversation. Her cheekbones jutted sharp against skin. I imagine lack of food does that to one’s body. Not a feet from me is a person who has probably lived with chronic hunger all her life. What that must be like, as being unable to read, is again unimaginable. She asked us what the project was about and made appropriate responses about how good it was and for young kids to be able to take advantage of free books. After establishing some rapport, she asked us for five pesos. I normally do not give alms, but I gave her twenty, amazed that she did her begging with a strange kind of dignity. She said her thanks and proceeded carting boxes and trash away. I glanced over at the thinning crowd at the leftover books sitting on the cement. I imagined what sort of person I would have turned out to be had I not been born in a family that could send me to school, or afford me books to read. Because language carries, as the written word carries, I imagine illiteracy holds one inert, frozen in the immediacy of hunger and thirst, of life and death, of negotiating now and tomorrow. From Waking Life. "The quest is to be liberated from the negative." Last night we caught a glimpse of two men locked in a dance of swinging fists. The incandescence of the lampposts shone a spotlight on their tango as all else scurried away. I slowed. Through the sanitized censor of my car window, we witnessed what was probably an ordinary occurrence in Manila’s slums, where the only law that ruled was the law of the strong. I had not seen violence in proximity for quite some time, and the glint of blood was an energizing jolt. The slighter of the two was swaying unsteadily on his feet, as the bulkier one aimed shots at his body. The bigger man, muscles bulging in his wife-beater, stood sure on his. The one on the receiving end of the blows was not fighting back. Was he drunk I wondered. One, two, three, four blows. I did not hear bone connect with flesh, but my face grimaced in shared pain. Slighter Man did not even attempt to block the flurry of fists coming his way. Some people stood at the sidelines, and other cars slowed to watch in what must’ve been a mix of curiosity and horror. I looked away a moment to see whether I was about to rear-end the vehicle in front. Next I looked, a ribbon of blood flowed freely from Slighter Man’s nose. Its color was unlike the blood we see in the movies. It was a rich, deep shade of red, not unlike the skin of ripe Australian plums. It caught the orange light from the lamps and glinted a sinister little shine. It spilled now to his lips, down his chin, all the way to his neck. I wondered what Slighter Man thought as he tasted the copper of his blood. Was he being beaten over money? A woman? Some unnamed injustice? Bruised pride? I honked my horn once, as if this would halt the violence unfolding before my eyes. But the insignificant little noise made by a passing vehicle went unnoticed. Bulkier Man was too intent in his pummeling. As we drove past, more people seemed to slow and notice. But no one came to Slighter Man’s aid. “This is a hard part of town,” said Butch. I made a noise at the back of my throat, as the men shrank in my rearview. A hard part of town indeed - where the rule of law was a luxury. Beat or be beaten. Kill or be killed. Slighter Man was crossing the road to get to the other side, slow and deliberate in his movement, as Bulkier Man gave chase. Their bodies bathed in the headlights of oncoming traffic, marionettes still engaged in a deadly shadow play. And we drove away. A dark shade of blue and red. The stripes on his crisp white played tricks on my tired eyes. They made him look taller, sharper, more alive. The fluorescent lights were uncharacteristically soft that night. Seated on the blood-red sofa, they lit him generously. He seemed happy. And I wasn’t the mass of nerves I usually am in his orbit. A couple of beers before our dinner calmed me down from the manic belligerence of the week. I was spoiling for a negotiation of terms, something on which to map the trajectory of our paths interweaving. I’m not big on ambiguity. Not about life plans, not about immediate tasks, and certainly not about things I’ve decided I wanted badly. I was prepared to bargain to a point. But I was also prepared to lose it all. I rehearsed them all in my head, what I’d been meaning to talk about. If I didn’t think the terms yielded me an ounce of peace of mind, I wanted out. And then he came with his dorky “allooo” and I forgot. As we poured over the menu, I pretended to care what to eat. I rarely ever crave anything other than fish or something spicy, so I settled on the fish. He said to share a salad. I remembered our first dinner together, all those weeks ago. He didn’t like the salad we ordered then. For the life of me, I still don’t know what was wrong with it. A salad is greens, yellows, reds and oranges dribbled with browns or creams. One appreciates the crunch and other textures. A salad is something one ingests to assuage guilt over the heart-attack food one has for the main meal. A salad is a salad. I’m not big on small talk, over-the-dinner table conversation. I credit my parents, who were sparing with words, preferring to do rather than say. We talked about the food, the people we knew, work, stuff. I had a million questions about him. Details to fill in my rough sketch. But I never felt quite at ease to ask, it wasn’t my place. There’s sticking tongues in each other’s throats, then there’s peeling those protective layers well-hardened over the years. I can’t imagine anything quite as scary as taking off those layers, for someone who wasn’t brought up to believe himself to be nigh indestructible. Like me. I didn’t have a campaign to scale the walls of his fort. I never do, trusting my inner marshal wouldn’t lead me falsely. From without, I looked across his moat, up the formidable towers casting long, long shadows. He was tantalizingly substantial and opaque, too much to resist. Amazingly, I was never intimidated. I was often annoyed and pissed off, but constantly intrigued. Looking back, I wonder now whether I should have laid an elaborate siege plan. Maybe then I can convince myself I’ve tried everything before signaling the retreat. And not to have regrets. He’d chosen to see a horror flick over my suggestion of a testosterone-laden whimsy about cars and cops and robbers. I found his popcorn habit weird, but then he’d always struck me as a creature who abided by the rules and followed the protocols of dictates of norms of normalcies. How bizarre, for someone everyone would surely categorize as ‘not the norm.’ I don’t know whether the preoccupation with following those protocols convinced him he was not the freak he is. Si tendre, mon original. The cinema was as cold as his elbow was warm. Munch, munch, munch went the popcorn in his mouth. I wanted desperately to be scared by the movie, so then it wasn’t money wasted on a rollercoaster that didn’t dip or crest. I wasn’t disappointed. I remembered how it was when we first saw a movie together. We’d been first in the cinema. The stillness of the space, I thought, had been shockingly intimate. But we hadn’t touched then, even though I’d longed to. There his thigh had been, resting, fidgeting. Twenty minutes in he’d nodded off. How adorable, I thought. I’d squeezed his shoulder and he’d woken with a start and grabbed my hand. Thinking back now, I wonder if I’ve imagined it all. Munch, munch, munch went the popcorn in his mouth. At each cheap trick of our horror flick, we willingly surrendered. Every start was punctuated by the release of bated breath and relieved chuckles. The warmth of that elbow radiated warmth all over. He finished his popcorn and made a big show about cleaning up. He settled. I uncrossed my right leg over my left to cross the latter over the former. Then I felt a pinch on my arm. What a weirdo. And the radiating warmth burst into a small flame. A couple more pinches at every scary start. I was grinning internally and grimacing outwardly over the horrific manipulations of our horror movie. I leaned over to smell his shoulder and made some idiotic comment about him smelling nice. He’d been under the sun all day he said. I’d always loved how he smelled. He straightened up and stretched, and casually put his left arm around me. Outside my brain it must’ve unfolded in real time, but inside it went in slow motion. Then he had his arm around me and naturally I fell close to his side. And inhaled. Every so often he would dip his head close to mine as we gazed up the screen. Like magnets our free hands caressed and stroked, mine bigger than his. Bizarreness. And it felt so marvelously right. There wasn’t any post-mortem of the movie after, just a quiet companionship, and a few exchange of words as we made our way to the parking lot. It felt right to be quiet as our feet fell in step. He walked me to my car, and I opened the door. I knew when I turned back I would get what I’d often thought of since that furtive first. Bizareness. And still, it felt marvelously right. There are moments now when I doubt the veracity of those episodes. I check my phone and wonder whether we'd said what we did. And I wonder now if we'd really meant it. His messages stare back at me, a tenuous foothold on reality. Those moments seem so long ago at times. And there are moments like now, when they seem as recent as an hour ago. Dream the world into existence, goes one Aussie aboriginal song. But there are limits to wishes. And some things, no matter how hard one tries, cannot be dreamt to come into being. Maoist China had only the People’s Bank of China (PBOC) as the sole financial institution. Under the centrally-planned economy it served a redistributive function and allocated funds to state-owned enterprises. Like most developing countries, the Chinese government is a major employer. Until 1994, the central government supported SOEs not only to foster industries but also to maintain full employment. As of 1995, 83 percent of all SOE loans were from the Big Four. Estimates of as much as 40% of these loans are based on “policy directives” rather than commercial profitability. The economic reforms of the late 1970s made China’s non-state sector the economy’s growth engine. This sector, which included township and village enterprises (TVEs) in the cities, collectively-owned enterprises in the countryside, private enterprises and foreign-invested enterprises (FIEs), benefited greatly from market liberalisation which removed trade barriers in various goods and facilitated import of raw materials. This growth was however constrained by the nature of the China’s financial system, which was primarily geared towards financing state-owned enterprises. To alleviate losses in policy-directed loans, so-called because of their political impetus, further banking diversification, along with other policies, were carried out in since 1994. Three financial institutions were created to address specific development policy objectives – the Agricultural Development, China Development and the Export-Import Banks. This freed up other types of lending for commercial purposes. In 1998, the Central government re-capitalised the Big Four ($34 billion) and established asset-management companies (AMCs) and paired them with the banks to help balance sheets. New accounting standards were also put in place to make it difficult for the Big Four to hide their bad loans. Guonan Ma, a senior economist at the Bank for International Settlements estimates that China's bank restructuring costs has amounted to RMB4 trillion (USD500 billion) as of 2005. The Ministry of Finance and the PBOC have shouldered 85 percent of the bill so far, and the rest shared by shareholders and customers both foreign and local. Despite the reforms of the 1990s, China’s NPLs have not significantly abated. As of 2006, China's NPLs may approach 30 percent of GDP. However, what the reforms have accomplished is the concentration of public loans away from small and medium enterprises to the bigger players of the strategic sectors mentioned earlier. Between 1995 and 1999, employment in state sector decreased by 26.9 million and increased by 50 million in the non-state sector. About one-third of the small and medium SOEs have been privatised resulting to a decrease of workers in the public sector from 113 million in 1995 to 67 million by the end of 2004. The reforms post-1994 have also led to the concentration of risk among a smaller number of SOEs. Similar to Japan’s banking crisis in the 1980s, China now faces a concentration of loans in hand-picked “winners.” In Japan smaller firms which were not given preferential access to lending sought cheaper financing from capital markets abroad. This in turn quickly made the Japanese hand-picked “winners” into losers as their profitability fell. While foreign observers laud these reforms, some things have not fundamentally changed. The banking system is still statist. The three policy banks and the Big Four are still majority state-owned (62 percent). Even alternative sources of financing, such as the stock market, are largely state-dominated. SOEs still receive the bulk of funds from SOBs. The status quo, while having improved on the past, is clearly still unsustainable. As China transitions further into capitalism, the public sector cannot possibly shoulder losses for very long as this damages China’s overall competitive advantage. Preferential loans lent to the public sector have resulted to a ‘glut’ of credit to the more dynamic parts of the economy, the private sector, which now accounts for about 40 percent of total industrial output. The percentage of new loans that went to this emerging group actually declined from 22 percent in 1998 to 14 percent in 2003. The transition to more market-based financial decisions has been painfully slow and deliberate, owing to the political and social roles played by China’s banking institutions vis-à-vis the rest of the economy. The reforms of the past decade have nominally ‘massaged’ the bank books so to speak, and have reduced the losses incurred by the public sector – but value-destroying financial activities are still significant. The next session will discuss the strategies employed by the State in manoeuvring, as it were, the Chinese behemoth in the labyrinthine complexes of global capitalism. While initial changes of opening up the local economy to Asian capital were made in the late 1970s and continued well into the 1980s, it was clear that China was indeed, 'feeling for the stones' as it crossed the river. The 1990s finally saw some clarity China’s strategy by charting its course into what it has termed a ‘socialist market economy’ a duality of centrally-planned and market-based systems. This was a strategic choice that saved China from the US-sponsored ‘shock therapy’ experienced by former Soviet satellites in Eastern Europe. security of the country (Zemin 1997). Chinese academics engaged the Western conceptualisations of ‘globalisation’ and ‘interdependence’ with caveats. It was recognised that markets, production and capital had become truly global in the 1990s, and that the best way to manage globalisation was through multilateralism. Increasingly questions of the economy and environment were also being addressed, as well as issues which transcended borders and needed transnational solutions. Information revolution is recognised as the most important component of globalisation. Chinese scholars were also cognisant that interdependence does not mean everyone can win. They cite the example of the Plaza Accord signed by the Japanese in 1985. The United States forced Japan to make significant concessions which undermined its economy (perhaps leading to the recession). Not coincidentally these changes took care of the American deficit vis-à-vis the US. Thus began the elaborated concept of ‘security’ in Chinese strategic thinking. From 1978 to 1992, economic growth and national security maintained two separate logics. The boundary between the two became increasingly blurred in the mid 1990s. National economic security became the “most popular topic for Chinese scholars and policy-makers after the mid-1990s (Wang 2004: 528).” China’s defence white papers of the past few years are indicative of this trend. a more challenging task (Chinese Defence White Paper 2006). Financial security should be characterised not only by stability (i.e. resistance to external shocks) but also sovereignty – to ensure that foreign financial institutions do not control the local financial market and institutions and that market shares of overseas financial companies do not exceed fifty percent. He then goes on to cite examples dating back to the late 19th century of how American banks behaved as oligopolies – with strong support of the state sector. Sovereignty is ensured by the National Banking Act of 1863 which required that officials of banks and insurance companies operating in the United States – whether domestic or foreign - must be American citizens. ‘Sovereignty’ of other advanced capitalist economies was also cited. In 2004, for example, foreign banks had a 1.4% market share in Germany, 2.8% in France, 1.3% in Japan, and the largest share—at 12%—in Spain (Ye 2007: 573). With regard to the Asian financial crisis, some Chinese observers apparently do not discount that the ‘Asian miracle’, i.e. the Asian model of capitalism, was undermined by Western speculators deliberately. purchasing local companies at unimaginable low prices (Zhu 2001: 53). A stable and regularised access to external markets forms the backbone of China’s export-oriented external economy. Accession to the World Trade Organisation in 2001, which was negotiated over a fifteen year period, finally guaranteed China access to the panacea of the Asian developmental state model – US markets. Upon accession to the WTO, China agreed to a five-year phase in for banking services by foreign banks. On December 11, 2006, China fully liberalised its financial markets to meet its WTO obligations. Foreign banks must now be allowed to play on a level playing field as local ones. Foreign banks in operation more than doubled from 69 in 2000 to 173 in 2005. Beginning in 2004 more foreign investors were also allowed to buy shares in Chinese banks (Tong & Zheng 2007). Authorities expect that competition from foreign players would lead to qualitative improvement of the banks’ governance. But more than such technical fixes, the WTO commitments, as an external driver, were expected to further reforms of the protected domestic state sector – namely the SOEs and SOBs – which the State could not accomplish through domestic channels given their political sensitivity. A haphazard liberalisation of the Chinese capital account could lead to depositors rushing to move savings to foreign banks given the questionable record of domestic institutions. As such, the US has called on China’s failure to remain on schedule with its WTO commitments and the protectionist measures it adopted prior to the December 2006 deadline. A month before, the State Council issued the Regulations for the Administration of Foreign-Funded Banks. This mandated that only foreign-funded banks that have had a representative office in China for two years and that have total assets exceeding $10 billion can apply to incorporate in China. After incorporating, moreover, these banks only become eligible to offer full domestic currency services to Chinese individuals if they can demonstrate that they have operated in China for three years and have had two consecutive years of profits (USTR 2007: 89). A second bone of contention with regard to China’s financial system is its exchange rate regime. China has been pressured to revalue the Renminbi (RMB) since 2003. While China has allowed its currency to float within a narrowly defined band since July 2005, it has been reluctant to heed calls of the international community. While it is not clear whether US trade deficit with China would improve were the RMB to revalue, the US Treasury Department has “strongly urged” China to allow the RMB to float. It has even considered legislation that would penalise China if it does not do so. There are mixed data on how much (if at all) the RMB is undervalued. The IMF claims it is undervalued, but they cannot say by how much. China refused to bow to pressure because in the international game of ‘problem assignment’, China has so far refused to accept that the US trade deficit is its problem. autonomy of its members in choosing exchange rate regimes (Wu 2007: 7). China has indeed taken advantage of expansion of credit in the US economy for the last decade, having been one of its most robust export markets. Now that the US is in recession (Scopical News 2008), it will be interesting to see if China will finally devalue its currency and begin a serious undertaking of cultivating its own domestic markets. 5. China’s Grand Strategy: From Rule-taker to Rule-maker? As the US domestic economy falls into recession, China will have saved more than enough for the rainy days coming ahead and may be better able to weather the economic storm in its primary export market. The PRC will also have enough foreign reserves to continue importing vital commodities such as crude oil. And as the US dollar continues to fall in value, China may well decide to unload its holdings to switch to more stable currencies, such as the Euro. Various Chinese officials have already said as much. Because Chinese business interests are also state interests, any pronouncements of such kind are always treated as political threats. Former World Bank chief economist and US Treasury Secretary Larry Summers has used the term 'balance of financial terror' echoing the nuclear stand-off between the Soviets and the US during the Cold War. If China does decide to unload its US dollars en masse, will it be shooting its own foot? In turn, how will the US react? Given such patterns it is apparent that China is well on its way to flexing its financial muscles and has been successful at playing the high finance game. One would think that the PRC has been taking pointers from Samuel Huntington’s Clash of Civilisations – that the path to global leadership and power entails owning and operating the international banking system, controlling hard currencies and dominating international capital markets.